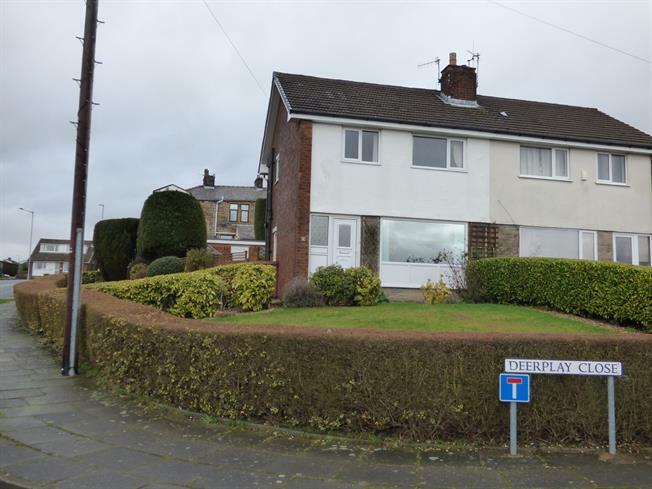 3 Bedroom Semi Detached House For Sale in Burnley for Asking Price £145,000. Set in a commanding plot with a beautiful views to the front, this semi detached property offers potential for extension (subject to planning permission) and would make a superb family home. Located on the ever popular Lane Head area, accommodation comprises of three bedrooms, modern shower room, through lounge dining room, well presented fitted kitchen and entrance hallway. Externally there are gardens to the front, side and rear in addition to a driveway providing off road parking and a detached garage. We have been advised that this property is leasehold and subject to a 999 year lease starting in June 1964 at a cost 13 per annum. UPVC double glazed door opening onto the driveway. Double glazed uPVC window with patterned glass facing the front. Radiator, built-in storage cupboard, ceiling light, stairs to the first floor. Double aspect double glazed uPVC windows. Radiator and gas fire, wall lights and ceiling light. Double glazed uPVC window facing the rear. Laminate tiled flooring, under stair storage cupboard, part tiled walls, ceiling light. Roll edge work surface, wall and base units, stainless steel sink with mixer tap and drainer, integrated electric double oven, integrated electric hob, space for washing machine, integrated fridge/freezer. Double glazed uPVC window with patterned glass facing the side. Ceiling light. Double glazed uPVC window with patterned glass facing the side. Heated towel rail, karndean flooring, tiled walls, spotlights. Low level WC, single enclosure shower, wall-mounted sink and vanity unit, extractor fan. The property is set in gardens to the front, side and rear. The rear garden comprises of two paved patio area, a gravelled area, a green house and a selection of mature shrubs and flowerbeds. There are conifers to the perimeter of the rear garden and access to both the garage and front and side of the house. To the front there is an extensive laid to lawn area with shrubs to the perimeter. To the side there is a laid to lawn area with shrubs to the perimeter and a path which provides access to both the front door and the side and rear of the property. There is a detached garage with power and benefits from an up and over door, there is also a door which leads to the rear garden.